Desk workers are notorious for sharing some of the worst aches and pains because they are confined to a chair for 8 hours a day. Not only does the affect your body physically but can also take a toll on your mental health as well. Many office workers experience back pain, headaches, stiff joints, and more ailments. 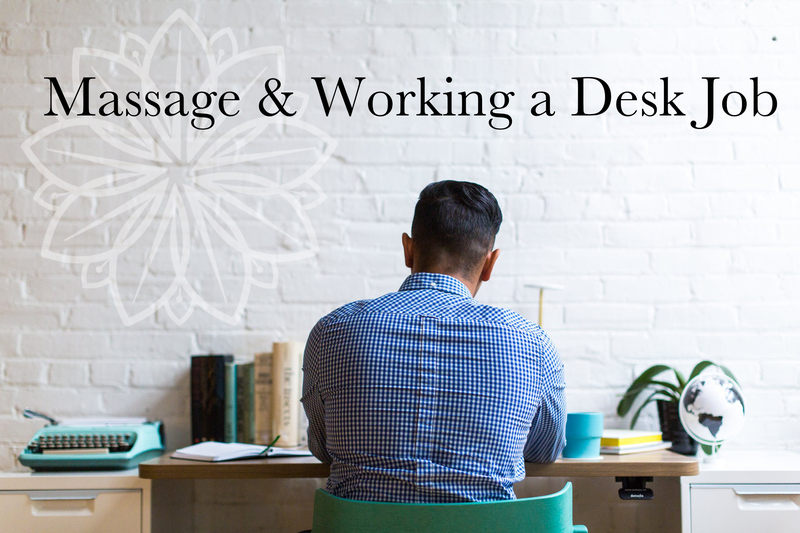 Massage can help realign your spine to fix your posture from bending over a computer all day and help to relieve the pains associated with desk work. Massages can counteract the bad postures your body is put through during the day. That means our deep tissue massage will work past the first layer of muscle tissue to relieve chronic pain and increase joint mobility. Not to mention, our relaxation massage is great to engage the sympathetic nervous system and relax the mind and body. This is especially great for people that have very high-stress jobs or tend to get anxious during job projects. What better way to unwind than with a massage? The strain of looking at a computer all day tends to give us headaches and migraines that just don’t seem to go away. Massages increase blood flow circulation and smooths out those tense muscles in order for them to heal. This gives your body a chance to relax and enjoy the break away from the desk. It’s not just your back and shoulders that feel the pressure – You can develop knots in your forearms and stiffness in your wrists from typing. With a full body massage we’ll be able to work out the kinks so you can keep pounding that keyboard. Massage is a great natural way to improve productivity, alleviate stress, and heal your body’s aches without the use of chemicals or drugs. While each situation is different, your body can greatly benefit from a professional massage tailored to your unique needs. With many different massage techniques available, Precision Wellness is your go-to for any and all treatments. Let us know your specific ailments when you come see us, and we’ll help you decide the perfect massage for you! We offer deep tissue, neuromuscular, relaxation, Thai, and CBD oil-infused massage at our location right here in Springfield, Missouri!